Guillaume Demoulin is the fourth generation of his family to farm the vineyards of Château de Trinquevedel. The eighteenth-century château was purchased in 1936, the same year that the Tavel A.O.C was established. Tavel is the only Southern Rhone Cru that is entirely made up of rosé. No more than sixty percent of the final blend can be made up of the noble Grenache grape. Guillaume and his wife Céline farm thirty-two hectares of vines situated in the hills of the Montagne Noire. Their stony vineyards are similar to those of Châteauneuf-du-Pape and the climate and sun exposure produce grapes with tremendous concentration and power. Finally, our favourite rose is available in a magnum bottle! 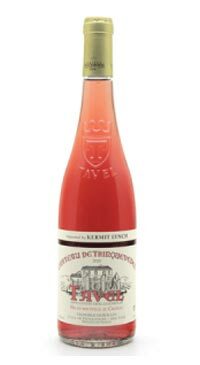 Château de Trinquevedel rosé is characterized by aromas of ripe, red berries and classic notes of sweetly spicy garrigue. It is a blend of 45% Grenache, 24% Cinsault, 15% Clairette, 10% Mourvèdre, 6% Syrah. After harvest the skins undergo a cold soak for 12-48 hours in cement cuve and are then directly pressed. Alcoholic fermentation lasts 20 days in cement cuve and the wine rests for 6-9 months in enamel stainless steel cuves. OMG it’s like two bottles in one! This powerful rose from the southern Rhone is packed full of ripe red berries and sweet spice, the perfect accompaniment to a day relaxing at the beach or tossing the old pig skin in the park…except times two! This is one of the few rose’s out there that benefits from some time in the bottle, so grab the current vintage while you can to compare and contrast with an incoming fresh vintage.